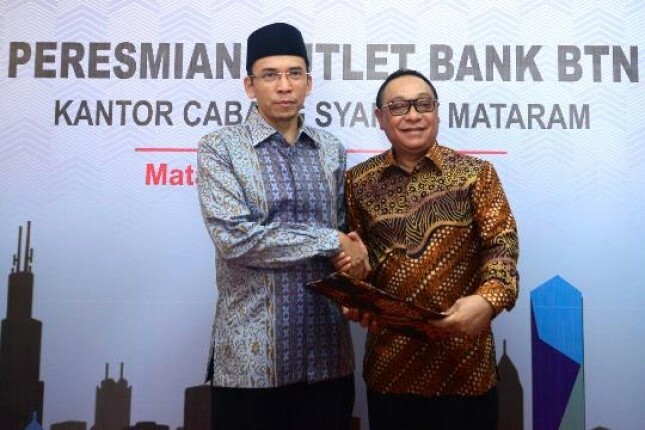 INDUSTRY.co.id - Mataram - Governor of NTB, Muhammad Zainul Majdi gave a positive response to BTN for the opening of branch BTN Syariah in West Nusa Tenggara (NTB). He said Bank BTN has an exceptional focus on touching a very important part of people's lives which provides financing or credit facilities for Indonesian families to have a decent home, where we know that the habitable home is one of the prerequisites for building a strong generation. "I hope Bank BTN will increase the housing loan portion in NTB, because the housing backlog in NTB is still very large and the people need for decent housing," he said in Mataram on Tuesday (9/1/2018). Head of NTB Financial Services Authority Farid Faletehan said the potential of sharia business in NTB is huge. Unfortunately, there are still many people who do not understand about it. "We hope the presence of Bank BTN can provide understanding to the community through socialization," he said.